There are many kinds of sheet music for the popular Chinese song Dan Yuan Ren Chang Jiu sung at Mid-Autumn Festival. When I asked my mom to select songs made popular by the late Teresa Teng besides my favorite Ni Ze Me Shuo, she mentioned Dan Yuan Ren Chang Jiu. On the night of the super blood moon and lunar eclipse, I learned of its significance. The lyrics come from a famous poem by Su Shi, also known as Su Dong Po. The song is associated with the Mid Autumn Festival, which is celebrated on the 15th day of the 8th lunar month. For 2015, it’s Sunday September 27th. Needless to say, there are many web pages about the song and the poem. The title of the poem is 水调歌头 shuǐ diào gē tóu which means water melody prelude or “Prelude to a Water Melody.” I like the English translation shown at the bottom of this web page. Just google the Chinese characters of the song title, and you will find many images of sheet music, just the melody, just the lyrics and chords, piano, guitar, and different combinations of traditional or simplified Chinese, pin yin, and SATB version for choir. Pianists can download the piano solo version or the accompaniment version for free from the website of Gang Qin Pu (Piano Score). There’s another piano solo arrangement from Zhao Ge Pu (Find Song Score) and one from Qu Pu 123 (Song Score 123). Or find it in E major on Cn Score. Here’s an elaborate piano accompaniment on China Qu Pu (Chinese Song Score). If you are a singer, you probably just want the melody and the verse. There are many versions in Jian Pu — simplified notation, such as the one below. 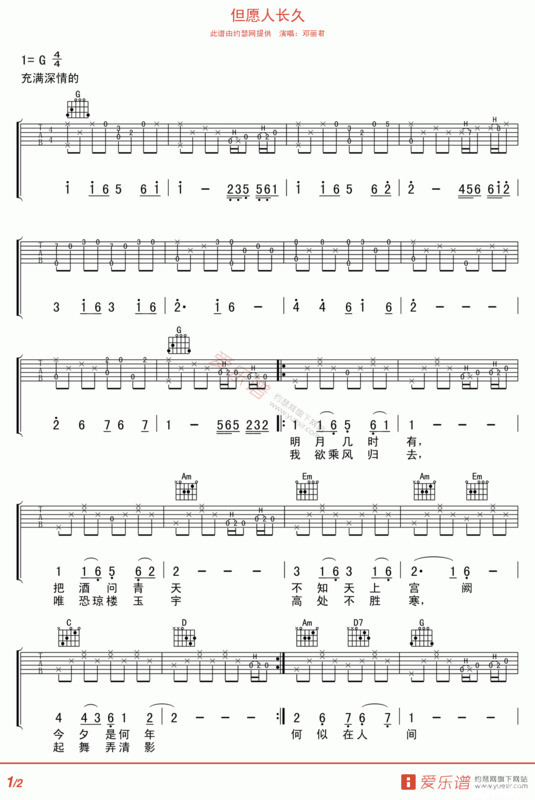 But I’ve not yet seen a lead sheet with the chords, melody, lyrics in pin yin, Chinese, and English translation. Maybe I’ll have to arrange it, if I want my Mandarin class students to learn it. Below is yet a different melody of the same lyrics. Always check the right hand side for the music. For guitarists who like to pick, here is a good one to accompany to the song. Here’s a version in pin yin and simplified Chinese. Below is a version in traditional Chinese with English translation.